Our Abpromise guarantee covers the use of ab25913 in the following tested applications. WB Use a concentration of 1.25 µg/ml. Predicted molecular weight: 140 kDa. Good results were obtained when blocked with 5% non-fat dry milk in 0.05% PBS-T. The protein encoded by this gene is a ubiquitously expressed nuclear protein. It binds directly, with several other proteins, to retinoblastoma protein (pRB) which regulates cell proliferation. pRB represses transcription by recruiting the encoded protein. This protein, in turn, serves as a bridging molecule to recruit HDACs and, in addition, provides a second HDAC independent repression function. The encoded protein possesses transcriptional repression activity. Multiple alternatively spliced transcripts have been observed for this gene, although not all transcript variants have been fully described. 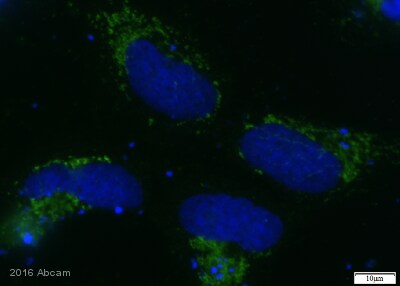 Anti-Retinoblastoma binding protein 1 antibody (ab25913) at 1.25 µg/ml + HepG2 cell lysate. ab25913 has not yet been referenced specifically in any publications. Publishing research using ab25913? Please let us know so that we can cite the reference in this datasheet.